My 1st term is coming to an end and we are given the upcoming test as well project submission dates. On reaching home from class on Saturday I was desperate to go out of Bangalore to get charged to combat the upcoming gruelling weeks at work and personal front with study. I had no clue where to go for a day and started to check my faithful websites and zeroed on Lepakshi from Anita’s site. While she made a detour and visted two other places on the way we just opted for Lepakshi via NH-7 as was not in mood for too much of adventure. After a sound sleep we woke-up at 8.15 AM; left home late around 10.10 AM, had breakfast in a south indian fast-food corner before hitting the road. City traffic was not that bad on Sunday and further away it was thinner. After leaving behind the international airport there was not much of traffic at all and we really left the concrete jungle behind. Soon we crossed Devanhalli (new destination of real-estate agents) and road towards Nandi-hills. The road from Devanhalli to Chikballapur is underconstruction which means sometime you get a proper highway or else DIVERSIONS with lots of big HUMPS. Those humps are actually meant for big vehicles like trucks and buses while I punished my little Indica with one or two whom I failed to recognize at right time. Chikballapur looked like is small town as we passed by without stopping. From there the condition of the road improves except few patches where it is undergoing big construction. Soon we were greeted by a big sign board which read “Eenadu Pradesh welcomes you”. Just after crossing the border we found RAXA Academy and AP Tourism Restaurant on our left. Right there we took narrow left turn and drove for another 15 KM for Lepakshi. It is a state road that goes to Hindupur via Lepaskhi. The road is narrow as well its condition is not very great. And as there is not much traffic we were able to drive in comfortable speed as long as one is alert. There are few patches where we found lush green paddy fields which soothes ones eye in scorching heat. 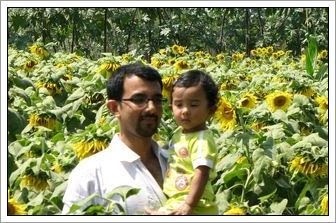 We stopped by to take some pictures with sun-flower plantation; it looked like an end of season for them. Soon we were able to see the back of big monolithic bull (Nandi). We reached temple in this heat around 1.40PM; and was relieved to be in shade. The temple is built by sandstone in Vijayanagar (Hampi)style of architecture. 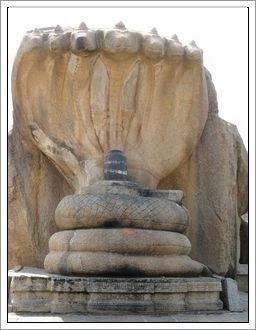 This is Veerabhadra temple where there is a big Monolithic Shiva-Linga. According to Hindu mythology, this seated Nandi (bull) outside is gate keeper of Siva and Parvati generally faces the main shrine. Here, it looks at this Linga (due to human settlements now the line of sight is obstructed). We went into detail tour of the temple as well courtyard. We almost burnt our feet while taking tour of outer enclosure. 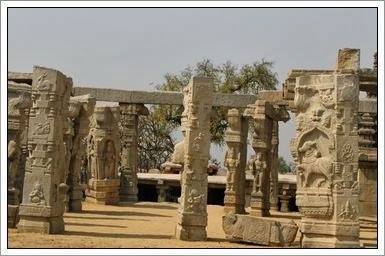 The temple is divided into three parts - the Nritya (Ranga-Dance) Mandapa, the Ardha (Worship) Mandapa and the Kalyana Mandapa with 38 carved unfinished monolithic pillars.The temple as a whole is built from sandstone and there are signs of severe erosion. I wish the whole place was more maintained and preserved for generation to come. Well, while going Aarush had a good nap but on the way back he was very active and naughty - as a whole he was a good kid.